I blog for many reasons including to engage with/learn from like minded people, to hold myself to account, to ensure I stay on the mechanical investing path I have set myself and to chart my progress to retirement to name but four reasons. 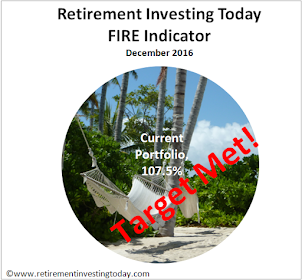 Charting my progress to retirement hit a significant milestone this week. Those with a keen eye who spend time on Retirement Investing Today will be familiar with a small chart on the bottom half of the left hand sidebar which asks “How close am I to optional work (retirement)?”. That chart has now hit a significant milestone passing over the 50% mark for the first time. Looking at my forecast today has me projecting retirement in less than 5 years at my current rate of progress. 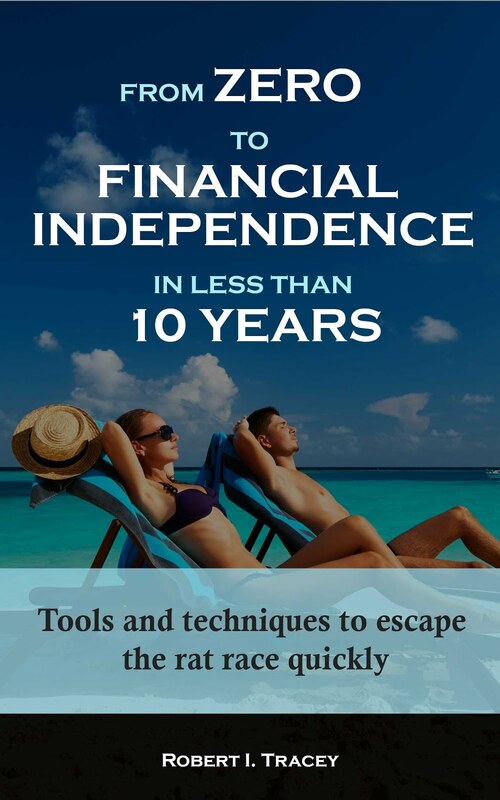 Sometimes it is really difficult to stay the course and continually month after month save up to 60% of your salary while friends and family have the latest television or mobile phone. However it’s days like today that make my strategy highly satisfying. Knowing I have no debt, are well on the way to financial freedom and at current rates will see “retirement” in my early 40’s has me smiling. Of course if I’m going to make my strategy work I have to keep a close eye on my tactical allocations. So let’s look at the ASX200 where my nominal holding (based purely on my strategic asset allocation) should now be 20.5% following my birthday (as mentioned in yesterdays post). The Australian ASX200 closed on Friday at 4801. 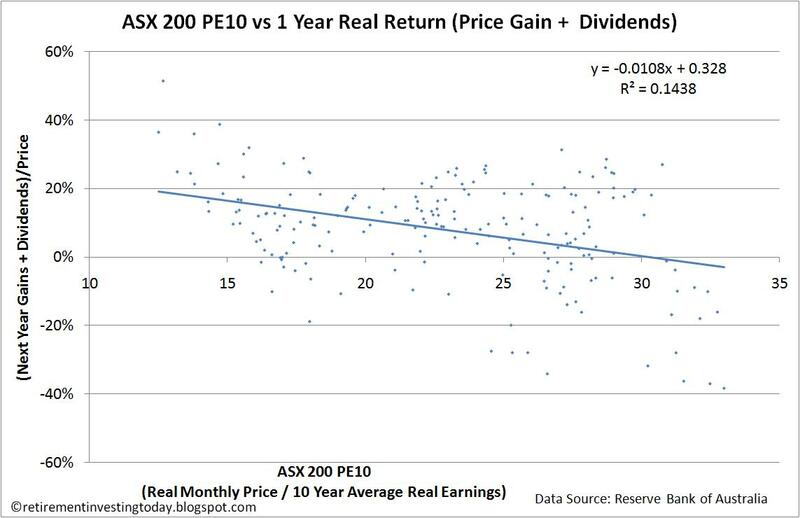 My first chart today shows that this price has the cyclically adjusted PE ratio (ASX200 PE10 or CAPE) at 18.0 which is up from 17.6 last month. Additionally this month for the first time I also chart the P/E ratio which is currently sitting at 18.6. This chart addition comes at the request of tk. Of course I then flex my strategic asset allocation by bolting a tactical allocation on top. I have decided that when the PE10 is 16 I will hold this 20.5% nominal. Otherwise I will pro-rata the holding based on the rules that if the PE10 is 6 I will hold 27.3% and if it is 26 I will 14.7%. So with today’s CAPE at 18.0 I am targeting a holding of 19.3%. Today I find myself a little over this target at 19.7%. 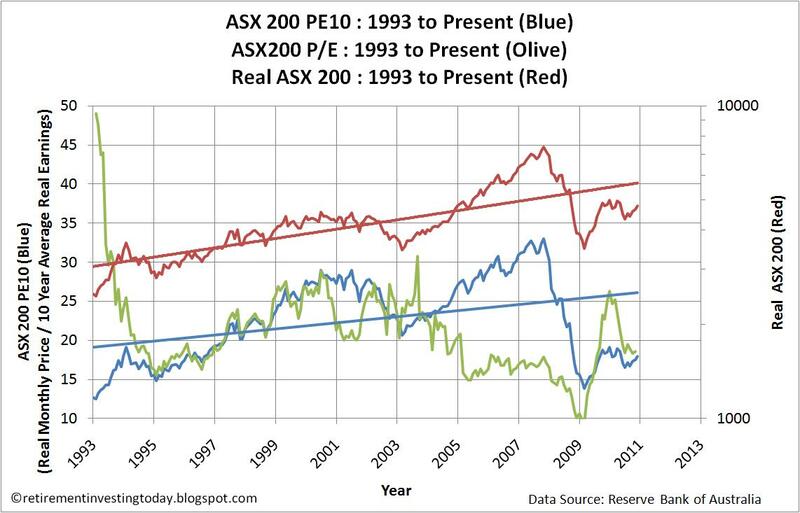 Some further data that may be of interest is that the correlation between the ASX200 Price and the ASX200 CAPE sits today at 0.78. The correlation between the CAPE and the future 1 year return is today -0.38 with the data points shown in my second chart. 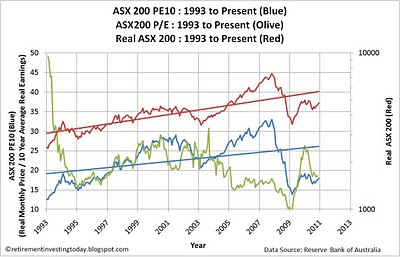 Using the trend line of this second chart with an ASX200 CAPE of 18.0 shows an expected 1 year return of 13.3%. 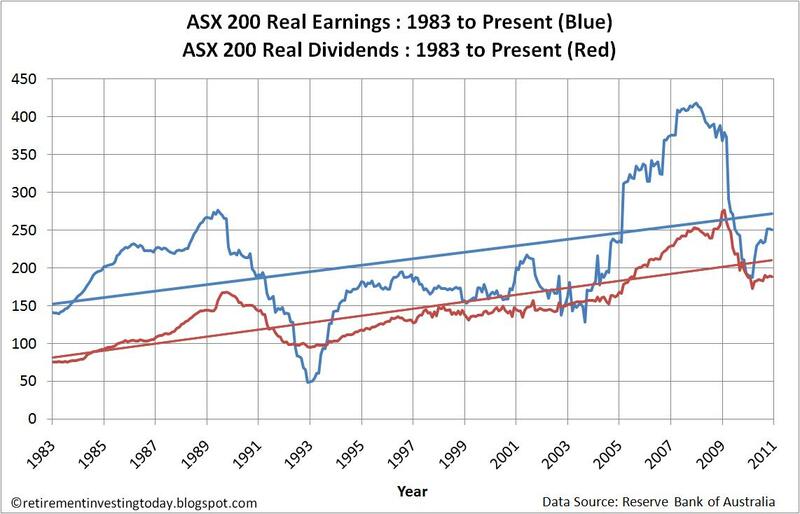 My third chart today shows Real (after inflation) Earnings and Real Dividends for the ASX200. 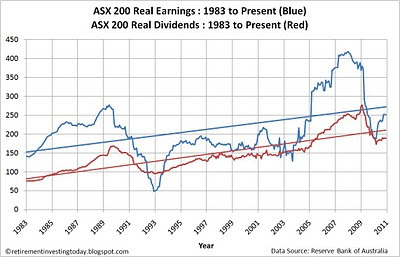 I’ve been saying this for a lot months now but Dividends and Earnings still remain below both of their trend lines. 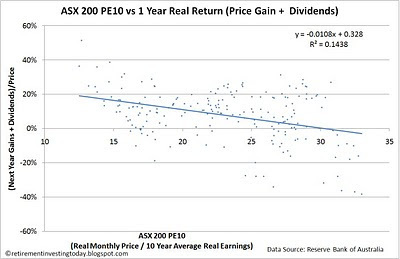 What is interesting though is that earnings are growing at a much faster rate than dividends. Could companies be squirreling some away in case we hit hard times ahead or are they building a war chest to enable some investment in the future? - November 2010 price is the 05 November 2010 market close of 4801. - November 2010 Earnings and Dividends are assumed to be the same as the October numbers. - Inflation data from October and November 2010 are extrapolated. Congratulations, an important milestone. With your strategy and aggressive saving I am sure your long term progress is assured, although I suppose short term fluctuations could push you back below 50%? Thanks. Yes I'm sure there is plenty of downside potential which could take me below 50%. The bad one would be a big jump in inflation with no asset price inflation going with it as my desired retirement 'salary' is adjusted yearly by inflation. A fall in asset prices would also do it however I wouldn't be to unhappy with that as it would likely present buying opportunities. Congratulations, you're going really well. Many thanks for the pe10 pe1 comparison. It's good to see how the pe10 smooths the curve. And the difference 2005-2008, that's interesting and I'm pondering on it! To me the difference 2005 to 2008 looks largely due to the short term earnings explosion (mostly due to debt fueled excesses around the world) which pushes the P/E down as its only 1 year but has a much more limited effect on the real 10 year earnings.